How to offer free products on my store? There are currently 3 ways to offer your product(s) for free. 1) Set the price to $0. Adjust the price to $0.00 at the bottom of your product editor page. 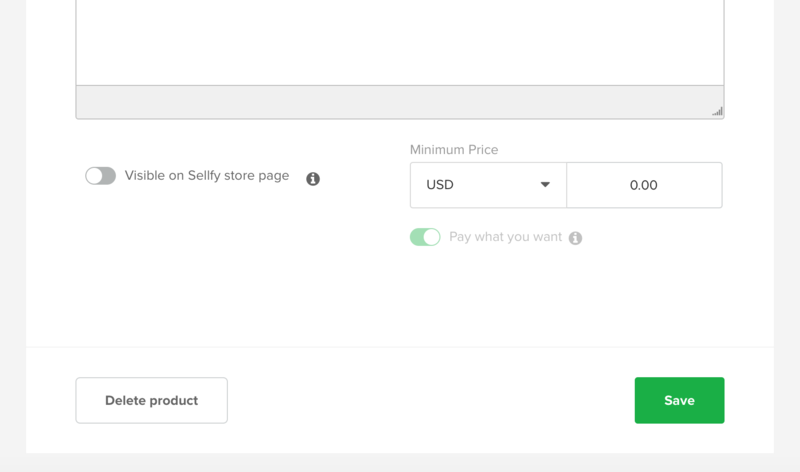 This will automatically enable the "Pay what you want" feature, and buyers will be able to choose to download it for free OR they may pick a price for the product. To offer 100% off the product price, go to the "Discounts" section in your account and select "Sale" after pressing "Add new discount". There, type in 100% discount amount. This discount will be available and visible to all customers who visit your store. Coupon codes allow you to offer free products to a selection of customers who know the code. To set up a coupon code for a product, go to the "Discounts" section in your account and select "Coupon" after pressing "Add new discount". There, type in 100% discount amount. Only the customers who have the code will be able to benefit from this discount.